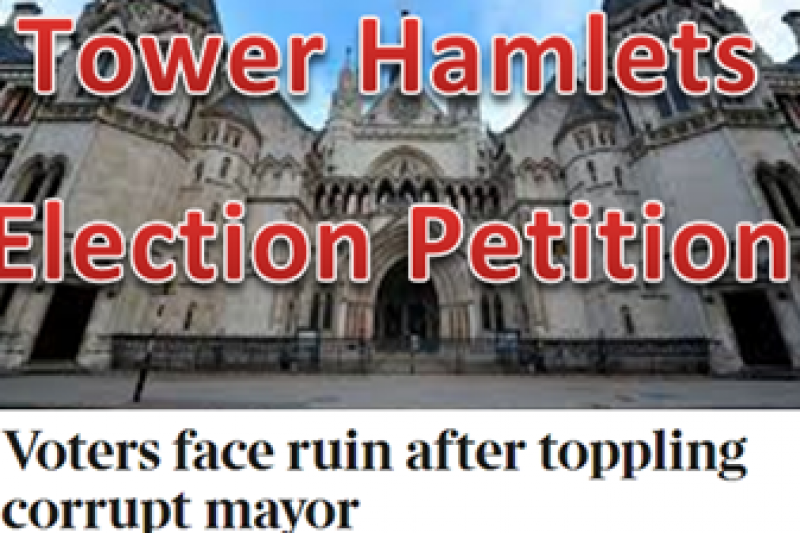 We are 4 Tower Hamlets residents who after seeing what happened in the 2014 local Council & Mayoral Elections decided to challenge the result in court with an Election Petition. We organised the case ourselves: gathering evidence and collecting witness statements from other local residents. With the help of our barrister Francis Hoar, after a case lasting over 6 weeks in the Royal Courts of Justice, we won and the Mayoral election was overturned. We were awarded costs but in the months that followed we have incurred high legal costs and we are now facing a shortfall even after the sale of the assets we have aquired. 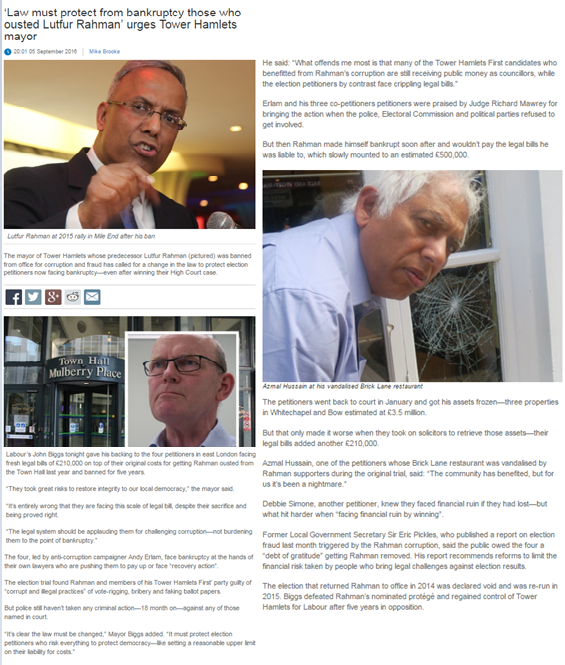 We took on this case for no personal gain, our only concern was to help bring back democracy to Tower Hamlets. Please see this recent article from the Sunday Times highlighting our current situation or see the article in the photo above. 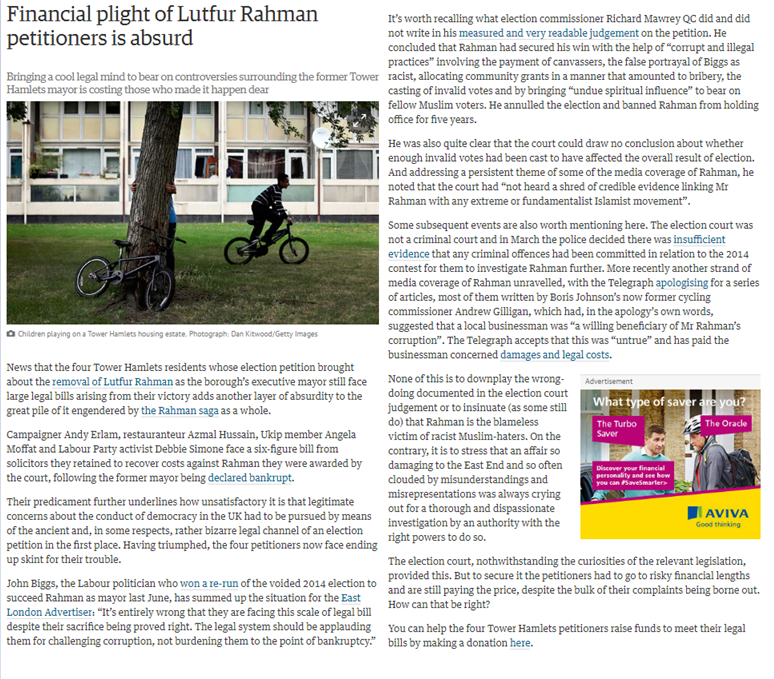 Anyone who knows me well knows how much I have suffered from being involved in the Tower Hamlets Election Petition. In many ways I regret ever having got involved as it has had such a negative impact on my personal life but when I see a newspaper headline like this one it puts it all in context. The UK law is to be changed BECAUSE of our case and it makes me very proud indeed. We are still potentially in a very bad position financially because of the case. We were awarded costs after we won the case and will shortly be selling the property that we secured but this will not cover all our legal costs unfortunately. 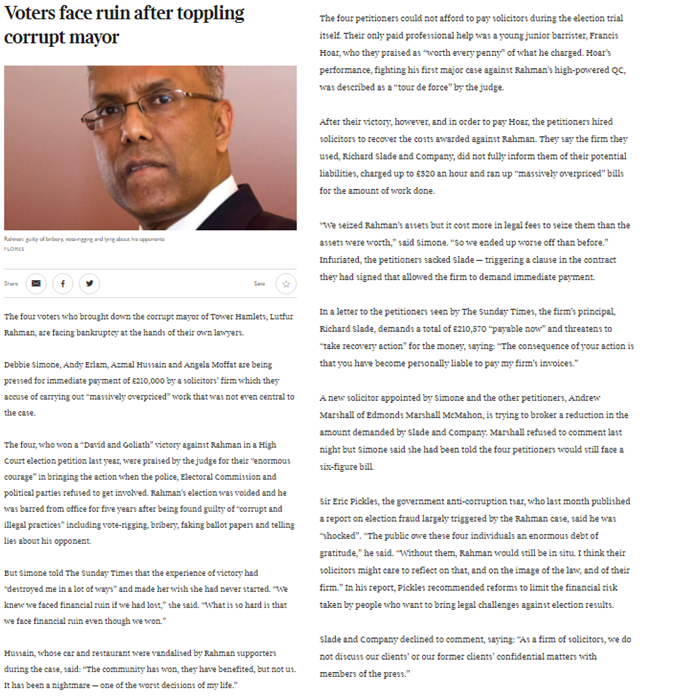 To add to our woes Lutfur Rahman may be mounting a further Judicial Review so the story drags on and on and inevitably the costs will continue to go up and up. Dave Hill has written a good article giving context and perspective to the case in the Guardian today. I'm really overwhelmed by people's kindness, generosity and support. Very encouraging and moving response - thank you! Andy Erlam, (one of Debbie's colleagues on the Tower Hamlets Election Petition.) PS We are glad the petition was useful. Its so appalling when YOUR OWN solicitors stab you in the back and are motivated by greed. By contrast our barrister Francis Hoar could not have been more helpful as is our new solicitor Andrew Marshall. Just heard about Section 40 (‘the Gagging Clause’) of the Crime and Courts Act which if passed would punish future campaigners even worse than happened in this case. Please sign and share https://org.repealsection40.org ! Hi Andy, Debbie et al. - I've donated, but surely the government should step in here and cover the legal costs from the public purse? It's the least they could do given their previous abysmal lack of action which put you in this very unfortunate position. Is this line of inquiry being pursued? Thanks again for all you've done!